“Her wings were ready, but our hearts were not”. It is with deeply saddened hearts that we share the passing of Yvonne Arvilla (Clyke) Jordan. Yvonne entered Heaven’s gates with a peaceful heart on Sunday, July 15, 2018, at the Colchester East Hants Health Centre, surrounded by the love she brought into this world. Fondly known as Bonnie to loved ones and friends, she was born and raised in Truro, N.S. on July 23, 1938, to the late Edward and Greta (Parsons) Clyke. She was married to the late Arthur Wilfred Jordan for 53 wonderful years. Bonnie worked in numerous positions outside the home before becoming a fulltime homemaker and took great pride and joy raising her children and grandchildren. She was a faithful and devoted Christian woman. Her Lord and Saviour was her strength, her passion and her delight as she faithfully served Him through Zion United Baptist Church for over 64 years, so when God called, she answered quickly. It was an offer she could not refuse! A reunion with her family and friends that she hadn’t seen in a while. This is a new mission for Bonnie that takes her to a place where she will be healthy, free of pain and able to share her love, gifts of service, prayers, baking and singing until her heart is content. When she stands before God, without a single bit of talent left she can say, “I used everything you gave me” and he will say “Well done, good and faithful servant”. She was a member of the Zion United Baptist Ladies Auxiliary, held office of Treasurer in the Church, was a member of the Stan Chook Maxwell Playground Committee, previous member of the Lady Barber Shoppers and enjoyed bringing the gift of song and fellowship to nursing homes and hospitals to brighten the days of many. She was part of the Colored Improvement League and she diligently supported her husband with Apex Cleaning Services Limited. She was honored by the Apex Golf Invitational Association for her commitment, and volunteerism in community and church. Her joyful spirit and lasting memory is carried on through her children, grandchildren and great grandson who all cherished this wonderful woman – daughters, Tina, Ardith (Kerry Simmonds), Tessie(Don Dixon), son, Trevor (Jo-Anne), grandchildren, Courtney(Tess), Chance, TJ (Felicia), Taran, her only granddaughter, her very own special Angel; and great-grandson, Kingsley. She was so very proud of her grandchildren and great grandson, all of whom she adored and wished them so many blessings. They held her heart and enriched her life daily more than words can say. She is also survived by her loving sisters, whom she adored, Beverley (Leo Paris), Theodora of Montreal and Nordicia (Brian Drummond) of Truro; several nieces, nephews, family members and friends. Including her parents, Edward and Greta, she is now reunited with her loving husband, Arthur Wilfred and siblings, Rachel (Lloyd Jackson), Gloria (Bert Paris), Edward, Cleo (Stanley Maxwell), and Myra Clyke. We, the children of Yvonne Jordan were blessed to have the love of such a godly Mother. Mom you have given so much and asked for so little in return. Thank you for always being there for us, loving us, helping us, and paving the way. All that we are or hope to be we owe to our angel mom. Her goodness, her caring, and her wisdom will live on in our hearts, never forgotten and forever cherished. The Family wishes to thank community responders Fabian Paris, Mark Paris and Louella Paris as well as, Dr. Srivatsa and Dr. Nadour, Nurse Denise Aubrey, all the nurses from ICU and 3rd floor IMCU including Sonya Paris, Social Worker. We would also like to thank everyone for their calls, messages, flowers and support during this time. Visitation will be held on Friday, July 20th, 6 pm - 8 pm, in Colchester Community Funeral Home, 512 Willow Street, Truro. The Celebration of Life will be held on Saturday, July 21 at 11:00 am at Zion United Baptist Church, 454 Prince Street, Truro with Pastor Brian Johnston officiating. Burial will follow immediately after the service in Truro Cemetery, Robie Street with the repast to follow at Zion United Baptist Church. 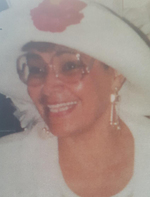 In lieu of flowers, memorials in Mom’s name may be made to Zion United Baptist Church or the Apex Invitational Golf Scholarship Fund, c/o Kevin Jackson, 9 Stone Hill Place, Beechville, NS, B3T 2T7. Funeral arrangements have been entrusted to Colchester Community Home. Online condolences may be sent to the family by visiting www.colchestercommunity.com.